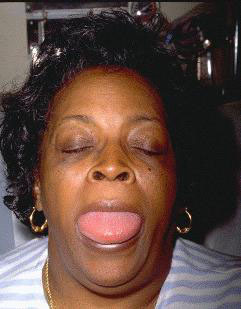 Angioedema is a well-demarcated, localized oedema of the skin and subcutaneous tissues (urticaria oedema involves dermis alone). There is local venodilation and perivenular infiltrates of lymphocytes, eosinophils, and neutrophils. Type 1 - 85% deficiency of C1E - INH. Type 2 - 15% enzyme normal C1E - INH dysfunctional. 75% have family history (25% spontaneous gene mutation). C1E-INH is a serine protease inhibitor. It is the major inhibitor of both factors 12A and kallikrein and the only known inhibitor of activation of C1 from complement pathway. C1E-INH regulates the activity of two plasma cascade systems. Responsible for vasodilation and vasopermeability. HAE patients have reduced or abnormal C1E-INH causing uncontrolled activation of complement and coagulation cascade, particularly in increasing bradykinin resulting in angio-oedema. Acute attacks are precipitated by trauma (dental), anxiety and stress. ACE inhibitors can also cause particularly in healthy people. Firazyr® (30mg SC) is available in both CUH ED (antidotes press) and from CUH pharmacy ( via night sister out of hours). Firazyr® should only be used (in CUH) upon direction from either the duty EM consultant or Dr Paula O'Leary. Content by Dr Íomhar O' Sullivan 23/09/2002. Reviewed by Dr ÍOS on 21/02/2004, 18/07/2005, 25/05/2006, 19/01/2007, 18/01/2008. Last review Dr ÍOS 3/12/18.